We offer treatment and analysis services of operation and maintenance data. In order to use the data available in the plants to optimize their availability, we have developed expertise in the field of data collection (IOT), big data, analytics and predictive maintenance technologies. These skills allow us to offer our clients a series of service based on IBM Cognos and PMQ software solutions. The facts are simple: thousands of signals are generated every second on plants and simply stored on servers without exploiting them. data analysis to predict failures. Finish flying blind with advanced analytics ! Our “Qbox” are designed to collect any data types on your machines or in connection with your digital control system. Architecture and selected technologies will optimise the flow of data in your networks and will not require any changes to your current network architecture. The implementation of Advanced Dashboards will be carried out using the Cognos from IBM tool that allows to treat and represent the raw data in a usable form by a human brain. Replace hundreds of Excel tables to update by Business Intelligence (BI) process that allows a true indicators monitoring and their visualization at all levels of the company. 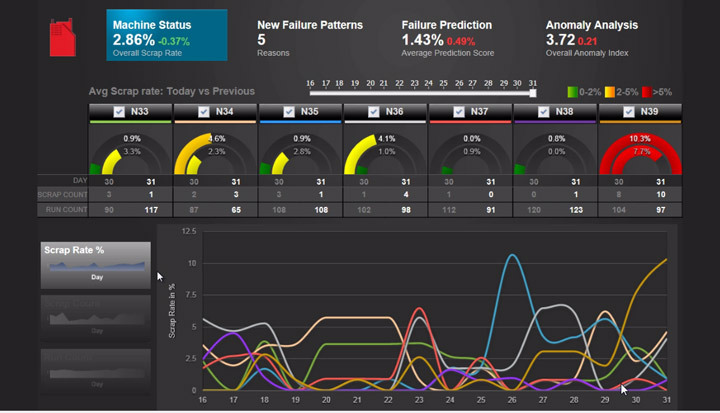 The second level of analysis of the data is to implement solutions to predict failures of equipment or processes. We propose the implementation of the IBM PMQ (Predictive Maintenance and Quality) solution to search for correlations between the causes and the effects of a problem. When causes breed or will recur, then the user will be informed when the problem will happen and its nature. This solution can of course be coupled to the IBM maximo CMMS (or other) to automatically generate work orders.